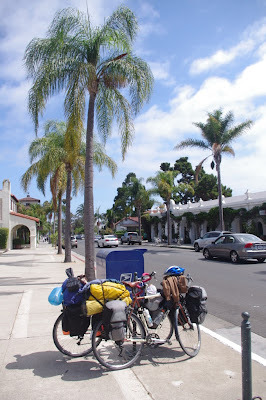 During the last week our ride through Southern California brought us through the part of the state that most often typifies the entire state of California....beaches, surfers, palm trees, and a whole lot of friendly people. We have of course learned that this is only a small part of the state, but a pretty fascinating one nonetheless. We rode through the famous beaches of Malibu and Venice and they were alive with activity and chaos, and a lot of excellent people watching. The topography of the ride has also calmed down quite a bit....by that I mean there have not been nearly as many hills and we have had a lot flat sections. But, to make up for that we have done a lot of urban riding....the ride through LA took about a day and a half, but is was reminiscent of Toronto riding, so we managed alright. We have talked before about the network called warm showers, for those of you that don't know it is a large network of folks willing to host touring cyclists. Many of the hosts use the service or have used it when they are on tour. It has been an incredible part of our trip, becuase it has let us meet so many interesting people, and see places and things that would not otherwise experience. If you think that it would be fun to host touring cyclists (a very wholesome bunch!) you can check out the warm showers website here. This past week we have been hosted by four different people, and each time has been a new little adventure. We slept in a backyard with some chickens and a very old cat at Mike's place in Goleta...a little town on the edge Santa Barbara, Mike also took us to the best beer and burrito places in town. Then we stayed with a another Mike on a boat near Venice Beach... This might have been the coolest place that we have stayed yet...and we were floored by Mikes genorosity in sharing his very small space with us for the night. On the other side of Los Angeles we stayed with Diane and Dennis, and shared stories of travel by bike around the world, we were also treated to some delicious cookies ! Now we are staying with another couple in San Diego, Ann and Brad...who have, like so many others, taken us into thier home with no reservation at all. It is pretty incredible, and we only hope that one day we will be able to pay back this kindness. First swim in the Ocean! Finally the water is warm enough for swimming, and still cool enough to be refreshing (we know that this might change soon enough). In Corona del Mar, on the south side of LA, we went for our first glorious swim. It had been a very hot day and it was oh so refreshing. Also, most of the public beaches in California have showers to rinse of the salt water.... What smart thinking! It was a lovely evening swim, however, there was an orientation going on for new UCLA students on the other side of the cove.. And some of them decided that it would be a good idea to stand on the top of the cove which overlooked our beach and moon everyone and everything....then when they weren't getting enough attention they decided to expose some other parts, luckily an angry father chased them away in a hurry...oh California. Well, the vast majority of drivers have been very courteous to us as we have pedalled along... But sometimes they yell profanities at us. The other day a driver from across the highway yelled "f*** you!". We were pretty confused, and I was sure that it couldn't have been directed at us....could it have? As we road a long we tried to make sense of why someone would yell this at us? We came to the conclusion that they could not possibly have sworn at us, and that we must have mis-heard, and really he said "thank you..........for doing your part for the environment".... That makes a lot more sense, right? So, when we last updated the site I was resting to try to heal a sun rash situation that had occurred because I had started antibiotics for an infection. Well, for about a week... It felt a little like my body was at war with me. I ended up getting new antibiotics becuase the first ones were not working very well. The sun rash unfortunately persisted for about five days...not the best timing as we have had the hottest and sunniest weather yet. The sun rash was hot, itchy and bumpy. Too make things more exciting, we both got a little poison oak on our legs. So things were itchy and uncomfortable. As usual, I thought that these ailments were certainly going to last forever and would have to call off the entire trip....a little catastrophizing goes a long way. But, miraculously, I have recovered, just in time for our entry into Mexico! Countless people have asked along the way if we are scared to cycle in Mexico. Glenn, when asked this, confidently shakes his no. I have a little trepidation, but we have done a whole lot of research and had correspondence with a number of oth folks who have very recently crossed into Mexico on bicycle, and all have said that they have not had any problems at all...and that infact they were struck by the incredible kindness of the Mexican people. We cannot say with any authority at this point, what it will be like, but we do feel confident that we will be safe. I keep thinking about one forum where someone from Europe compared reactions to him biking in the USA that he had received from friends and family, who expressed concern that Americans were "bible-thumping, crazy rednecks who target cyclists", to reactions and fears that many North Americans have about cycling in Central America. We will tell you in about a week about our first impressions... And if these fears are warranted. Our plan is to head out from our home stay, which is about 25 km from the border, at sunrise. In order to get to the border as early as possible. We have a warm showers host arranged already for our first night in Mexico, he lives about 50 km frothy border, so we should get there by mid-day.